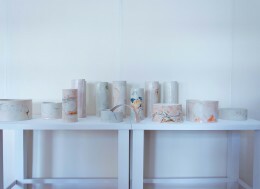 In the final year of her Bachelor of Fine Arts at the National Art School (NAS) East Sydney, Sarah Tracton researched and refined a technique of building porcelain canvass slabs into architectural surfaces. Intrigued by the intersection between design and function, Sarah’s sensory-inspired vessels won her the Australian Ceramic Association of Australia’s Prize for 3rd Year student at NAS. Upon pouring wet slip onto plaster surfaces, iridescent prismatic oranges and marbled chromatic panorama coloured surfaces akin to landscape topography are revealed. Sarah is artist in residence at Northcote Pottery Supplies from June – September 2016 where she will host pop-up sales, workshops and demonstrations of her unique process.